One of the biggest issues with traditional pavement, especially in areas with notoriously hot climates like Australia, is their heat retaining abilities. In the last hundred years, Australia’s climate (both surface air temperature and surrounding sea surface temperature) has warmed by 1°C. 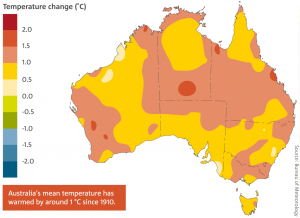 Australia’s southwest has also experienced a 19 per cent decrease in rainfall, while the country as a whole has experienced an increase in extreme fire weather, the duration, frequency, and intensity of heat events and the oceans surrounding Australia have warmed, while sea levels have continued to rise. A lot of people aren’t aware of this, but most traditional forms of paving soak up the heat from the sun’s rays during the day and then release that heat at night, which can contribute to rising temperatures. Asphalt is one of the biggest culprits, and Columbia University has reported that this issue is more prevalent in urban areas than it is in rural locations. Impervious surfaces, such as asphalt, are also detrimental to Australia’s climate because water can’t soak naturally into the earth – instead, it rushes across the landscape, carrying pollutants and biological contaminants with it. Studies from the University of Columbia have linked water quality and the percentage of land covered in impervious surfaces and has found that higher levels of inorganic substances can be correlated with both urban and agricultural land use. There’s also speculation that certain paved surfaces can be linked to an increase in a number of diarrhea outbreaks occurring after swimming in the ocean. This is why swimming in the ocean after heavy periods of rain isn’t always a good idea. In the past twelve months, there have been a number of instances in Victoria where certain beaches were deemed unsafe to swim in after heavy storm periods. Spray on paving is a viable alternative to traditional paving methods, as the UV-resistant sealer coat we apply doesn’t just help the paving retain its colour, it also doesn’t soak up the heat in the same way impervious surfaces do. Our spray on paving also doesn’t contain any potentially harmful chemicals, making it a safer option during heavy periods of rainfall. If you’re looking for a new, innovating alternative to traditional pavement, contact the team at Wespray on Paving today!